Today I had Maoz for lunch with my co-worker Andrea. (Drool over her new Missoni socks here.) I first saw Maoz when I traveled to Amsterdam in 2010 and I remember coining it as "the vegetarian McDonalds." I didn't try it then but I was intrigued to see Maoz start popping up in NYC upon my return from my semester abroad. 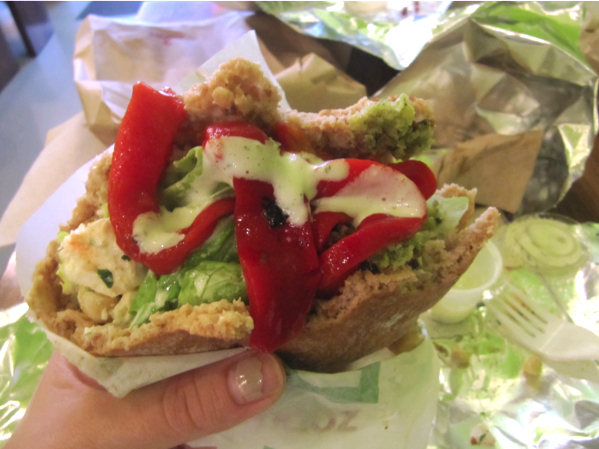 Maoz is a vegetarian fast-food joint specializing in falafel. You can get falafel in a pita or in a salad, choose from a few different add-ins like hummus, feta or baba ganoush for extra $monayyy, and then romp around the unlimited salad bar adding whatever you please FO' FREE. When faced with the dilemma of half eaten falafel pitta and no toppings in the middle, you can ravage the salad bar again. No worries or paranoia from Maoz about the possible unsanitary conditions of bringing saliva sprinkled food up to the salad bar -- they're totally into it! I went for a whole wheat pitta with falafel obv and sprung for the feta add-in. I was super overwhelmed at the salad bar but managed to concentrate hard enough to pick up chick-peas, roasted red peppers and cauliflower. I doused it all in stinky-delicious garlic sauce. Bottom line: Maoz is bangin'. First bite = light beaming down from the heavens. The falafel was moist and abundant. I never ran out of it; not even at the bottom of my pita. All of the veggie toppings seemed fresh and the feta icebergs were huge. Notice the greenish hue in the below photo? I could edit that shiz out real quick but I decided to leave it for effect -- the entire store is shrouded in neon green walls and lighting to match the green insides of the falafel. Chic right? Like my nail polish? (watch out Diamond Star, I'm hittin' you up this weekend.) This was taken after my second trip to the salad bar, but I'm afraid my photos don't do this beautiful food justice. Andrea had pretty beets in hers and there was green tabbouleh too. The situation really was just too messy to truly capture. You have to see it to believe it folks. Basically, Maoz is delicious and semi-guilt free. I hear that the french fries are really good especially with the garlic sauce, but something in my conscience prevents me from matching french fries with falafel. For this sandwich and a drink I paid just under $10. Best part about this whole thing is I ate lunch like a vegetarian and got totally food-coma full. Can't beat that. Maoz: 683 8th Ave., between 43rd and 44th. See site for more locations. I hear Manhattan College just put in a new Food Dining Venue Called Cafe 1853. I understand it to be a all natural cafe with sustainable, healthy & great food. You should check it out and let us know if you would... Stay!!! or GO!!! El, this place is BEYOND GOOD! So glad you've had a chance to enjoy it and blog about it. I've only been to the one in union square but its nice to know there are several throughout the city. Ahh... now i'm desperately craving a falafel!